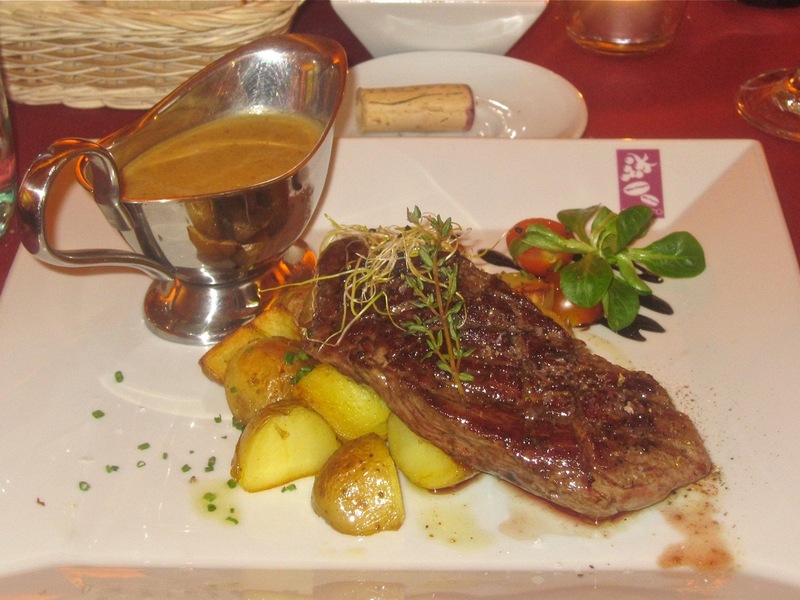 When it was suggested that I put together a list ranking my favorite steaks in Prague, I readily agreed. Call it a meating of the minds. Since the annual Brewsta's Burgers list always proves popular, why not extend the franchise? After hamburgers, steaks are definitely a top choice for me when dining out. This list consists of steaks I've eaten over the last year. Whether the steaks would be prepared the same way a day later or a year later, I cannot say. I can only tell you that this is what I ate and what I thought about it. Since I don't say these are the best, but rather my personal favorites, I will tell you my main biases up front: I greatly prefer more tender North or South American beef cooked over a flame. I tend to dislike the generally tougher and less marbled Czech beef. So, now you know. 21. Tapas Chorizo de la Cambusa Did I say favorite steaks? The ones here were my least favorite. The crashing disappointment was heightened by the raves on Tripadvisor saying how good they are. I tried the "Bavette Ambassador". It neither looked nor tasted like the American flank steak it was purported to be. This steak was one of the toughest, hardest to chew pieces of meat I've had in a long time. I even tried the more expensive Argentinian entrecote and thought they were virtually identical. I had no desire to finish either of them. 20. Zelena Zahrada I liked a lot about this restaurant. The steak? Not so much. It looks pretty enough. There was good, beefy flavor, but it was not very tender. It had grill marks on it, but it didn't have much of a grill taste. 19. Na Kopci Na Kopci is beloved by many, especially among Czechs. I'll probably take another beating for saying this again, but I didn't love the steak I had. It wasn't bad, but the meat was not tender and the flavor was unexceptional. 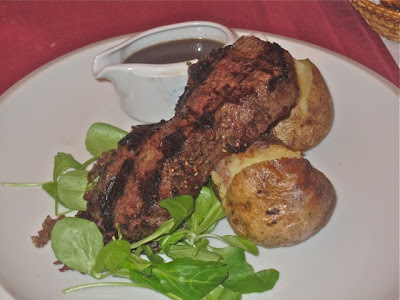 The Cognac sauce was excellent, but there wasn't enough of it to make the meat more appealing. 18. Jáma Steakhouse Yes, I only ate here a month after it opened. I haven't been back, though I've had people write to tell me it has gotten better. The New York strip loin I had was one of their better offerings. The Irish beef had a smoky flame-grilled flavor. Otherwise, it was surprisingly tough and hard to chew. It reminded me of many a Czech roštěná I've had. I liked the more tender rib eye much better, but it was one of the thinnest steaks I've ever had. 17. Céleste Bistro I tried their entrecôte with strong red wine sauce. I don't mind fat on my beef, especially on an entrecôte or rib eye. But this one had an unacceptable amount of gristle. Significant portions of the steak were inedible. Sure, you can cut around it, but it was disappointing. The red wine sauce was pungent, savory, and terrific. With better quality beef, it would be a favorite. 16. Baang! 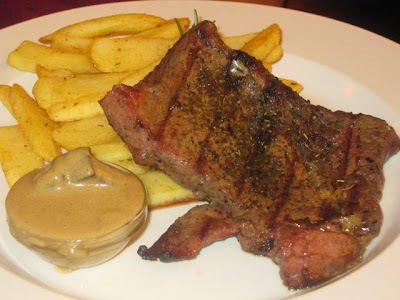 The strip steak "Dijon" at this modest restaurant was high quality Uruguayan beef. It was tender. It was tasty. It would have ranked higher, but for one problem. They completely drowned the beef under the creamy Dijon sauce. I scraped it off as best I could, but it detracted a fair amount from my enjoyment. 15. Cowboys Cowboys is an American-styled steak restaurant has an excellent location just below Prague Castle. I had high expectations. They were not quite met. I ordered the 250 gram rib eye. On the plus side, it had a wonderful flavor from the flame grill. However, the meat itself did not make for easy cutting. The menu says the cut is "the most marbled for more flavor." But marbled meat should also be tender. This one wasn't, and there was also a vein of very tough gristle though the middle. 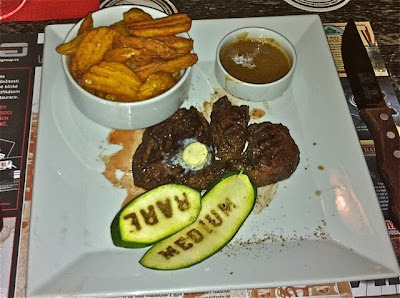 The sauce on the side, which costs 25 CZK extra, was sweet and tasted like red wine barbecue sauce. I'd understand if that doesn't sound appealing, but I loved it. 14. Gabriele Gabriele is a high-end Italian eatery, highly rated by others, and the chef, Gabriele Feliciani, has worked in many a Michelin-starred establishment. 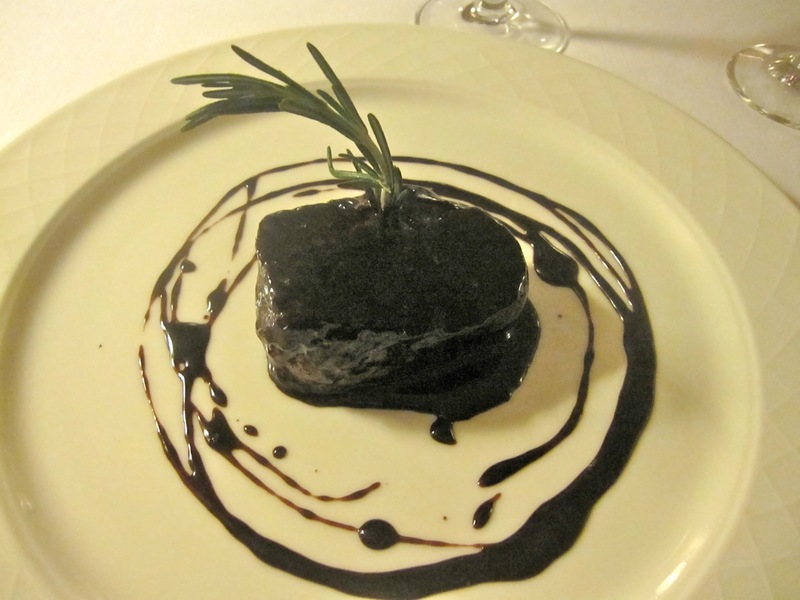 I went for a tasting portion of Apennine beef steak with Barolo sauce. 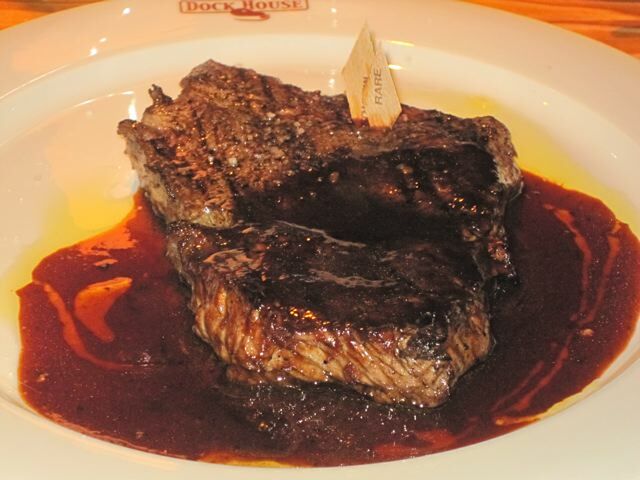 The full portion would be one of the most expensive steaks I've seen at 725 CZK. Worth the money? I didn't think so. The meat itself was not particularly tender and the flavor rather plain and unimpressive. Adding salt helped, but I've enjoyed many lesser-priced steaks more than this one. The sauce was the star, with the alluring perfume of the wine maintaining my attraction. The syrupy glaze on the meat and was both acidic and sweet, though it might be too sweet for some. 13. Čestr The proprietors of this new restaurant make much of its aged Czech beef, which is butchered on the premises. I had the 125 gram entrecôte with Périgourdine sauce. It was lightly salted and the natural flavor was pretty good. There was a light external crust from the non-flame grill. I had one problem with it. It wasn't tender enough for me. Even when the steak is from the very best of Czech beef, and it is prepared with the highest standards, I still haven't found one that meets my standard for greatness. 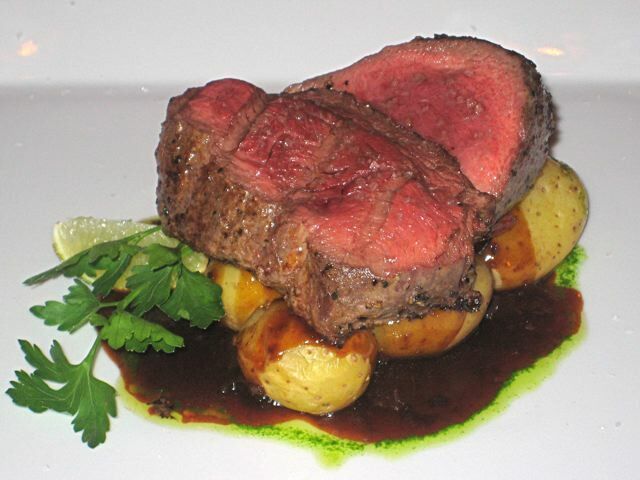 That said, the beef tenderloin, cooked rare, was more tender and a better choice. 12. Resto Cafe Patio The Argentinian entrecote came with streaks of a rich, salty gravy across the plate. The beef was excellent quality and the knife went through it easily, though it was not the most tender I've sampled in town. It was correctly, simply seasoned with salt and had light charring from the grill. But I wish I could taste more of that grill flavor. 11. Dock House Getting to Dock House is a bit of a trip from the historic center of Prague, but it is a favorite of many Czechs. I had the 300 gram Charolais entrecôte with demi-glace sauce. 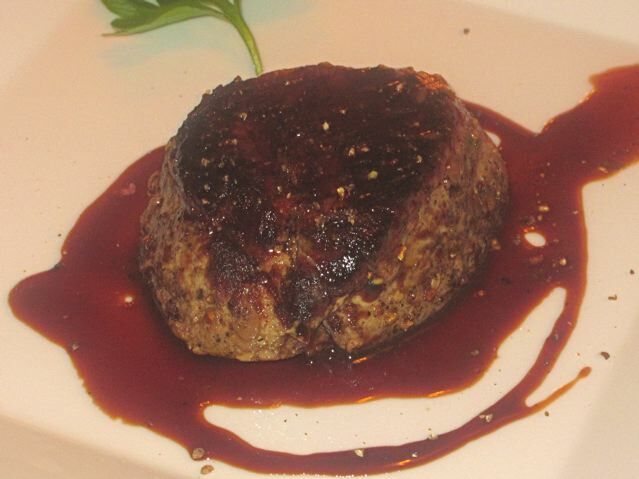 The steak was very tender, and there was no question about its quality. It was not very thick, but was cooked as requested to medium-rare. The only issue, to my tastes, was the lack of salt. There were a few rock crystals on the top, but it needed a strong shot of salt. 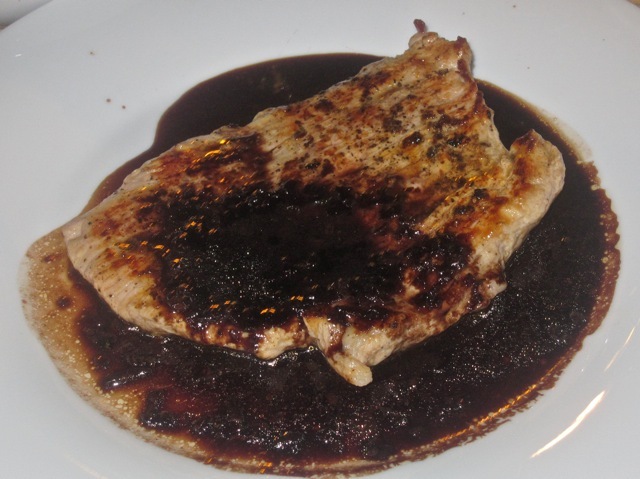 The demi-glace, a reduction of veal stock, vegetables, and browned bones, also needed salt. However, it was excellent after the saline levels were brought up. 10. Brasserie La Gare La Gare is probably the Frenchest restaurant in Prague. I went for the Bavette de Boeuf, which is a veal flank. I like this cut, and it is also one of the cheaper steaks. The menu said it was sourced from France. I asked for it medium-rare, but it came medium-well. 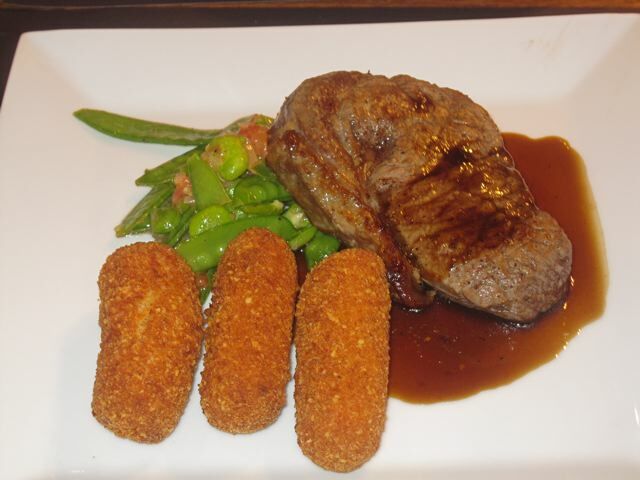 However, the light-colored beef was tasty and quite tender, except on its thinner edge. 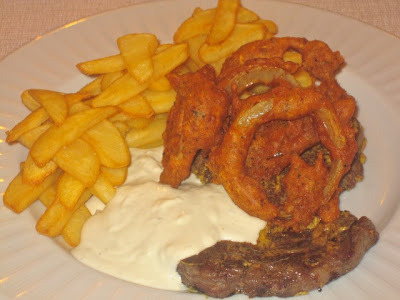 What really helped make it a winner for me was the shallot sauce. Made with liberal amounts of wine, the sauce was acidic, rather than sweet, and paired very well with the veal. I was soaking bread in it after the steak was gone. 9. 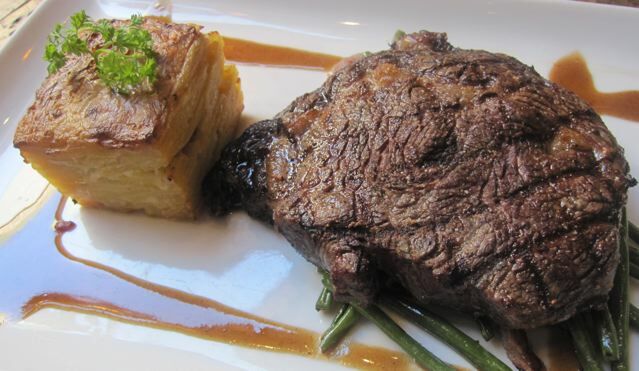 Ichnusa Steak is not always on the menu of this restaurant with no menu. But if the chef tells you it's on offer, I think it's worth a try. The Argentinean beef I had was thick and tender, with a slathering of balsamic vinegar syrup that gave it a tart-sweet coating. I did ask for it to be cooked medium rare, and it came out very rare, but I was not too bothered about that. The meat was so good, it was probably better that way. 8. Ristorante Carmelita Carmelita in Malá Strana is a tourist favorite, with many fans on Tripadvisor. I think it's overrated. But the superlatives about the steak are, in this case, justified. The beefsteak with green pepper sauce really was great. The meat was amazingly tender. I could easily cut the most beautiful slices with the less-than-sharp steak knife. 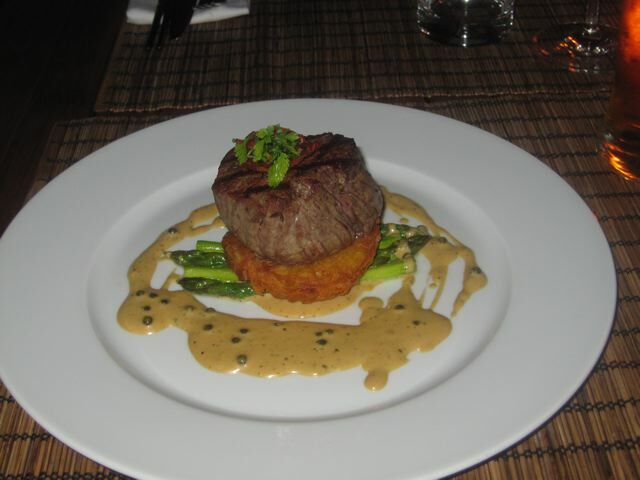 The beef was cooked perfectly medium-rare as requested, which brought up its excellent flavor. The creamy sauce seemed too salty at first, but I got used to it and ended up mopping it up off the plate. 7. La Bodeguita del Medio I don't go to this Cuban restaurant so often any more -- it's not cheap -- but I have fond memories of their mojitos and steaks. I loved the fillet mignon de solomillio a la parillia. The meat had great flavor from the grill. It was tender. The homemade sweet chili sauce tasted like it had an onion base. It was really delicious. 6. Chagall's Club The ever-changing menu listed an American flank steak. Having bought a few from Makro, I can say that this was the real deal. The beef was firm, yet all too easy to cut and consume. It was cooked perfectly medium rare with an excellent balance of salt and seasoning. There was a delectable pool of sauce Périgourdine. It had the rich, rendered drippings from the meat and a hint of peppery sweetness and wine for contrast. 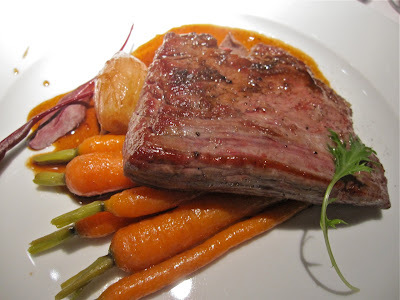 It seems the flank steak is no longer available, but if the Charolais entrecôte with green pepper sauce is anywhere near as good, it'll be worth a visit. 5. Bresto Café & Wine Bar Bresto, near Wenceslas Square, also serves a bavette or flank steak. The meat was clearly of a very high quality. It was expertly grilled, the amount of salt was just right, and it was as tender as it should be. To top it all off, the pepper sauce was among the creamiest and dreamiest I've had. 4. 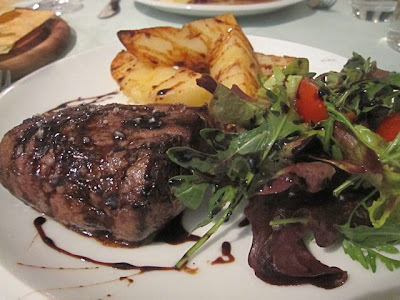 Restaurant U Emy Destinnové This American-helmed restaurant's Argentinian beef tenderloin with a Chianti reduction is my favorite non-flame grilled steak. The exterior had a scrumptious, peppery and charred crust. The interior was tender and it hit the right beefy flavor points. The sauce was sublime. I only thought it needed a dash of salt. That addition brought perfect balance to the sweet notes of its balsamic and honey elements and the assertiveness of the wine. I loved it so much, I licked the plate after I ran out of bread. 3. Crazy Cow Steakhouse On the whole, I don't like Crazy Cow restaurant all that much. Their hamburger was terrible. Some of the side items were not great. The service was spotty. But the steaks were excellent. The 300 gram rib eye was just beautiful. The beef sliced ever so nicely. It had gorgeous grill marks and the smoky char on the outside was just right. I even liked the fried onions underneath -- sweet and crunchy. 2. La Casa Argentina La Casa Argentina really annoys me, and I've tried it many times. Like Crazy Cow, there's so much wrong here. I've always found the service to be inconsistent and even arrogant. Many dishes are over-priced and I didn't enjoy much of what I ate on my last visit. And yet the steaks are among the best I've found. 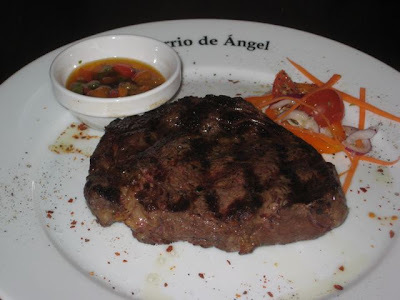 The 200 gram Argentinian Aberdeen Angus rib eye was great. It was tender, smoky, juicy, and cooked medium-rare as requested. However, the pepper sauce I chose was surprisingly bland. 1. El Barrio de Ángel While El Barrio restaurant is not perfect, it is a nice-looking restaurant that has the most of what I am looking for in a steak. 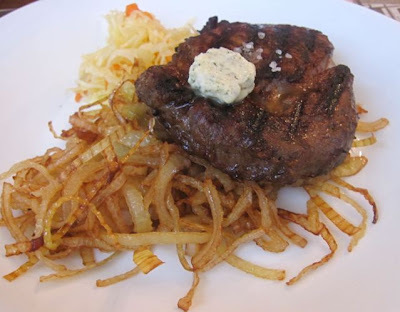 The last time I had their 300 gram Argentinian rib eye, it was terrific -- tender and smoky, with a clear flavor I've never found in Czech beef. It only needed a shake of salt or two. A mild, unexceptional chimichurry sauce was included, but sides are extra. Still, I thought it a good value on top of the good taste. And that's all he wrote. You got a beef with my list? Give us a taste of yours. Given the health issues involved with consuming large quantities of red meat, I must, in closing, issue a general warning. The mastication was carried out by a self-trained professional diner on a controlled main course. Your meat may vary. Anything you eat can and will be fused against you in a court of food, so help me Ronald. 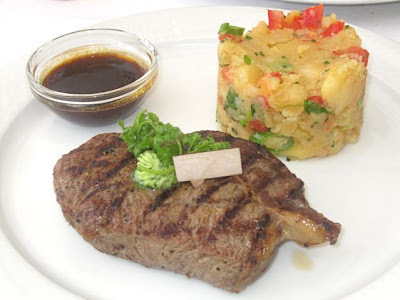 I had the misfortune of eating at La Casa Argentina recently. Afterwards I was told the quality had slipped--and I have to agree. 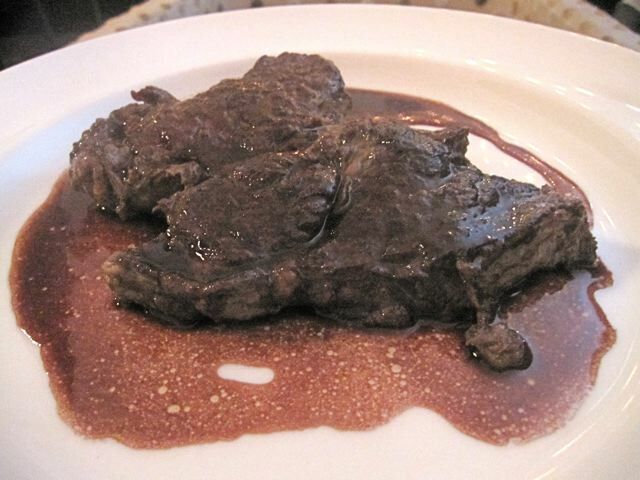 the steak I had was tough, chewy and almost devoid of flavor. The ambiance of the place only added to my consternation...plus the price/quality ratio is way off the mark. I would say it was my second visit to this restaurant: both first and last. 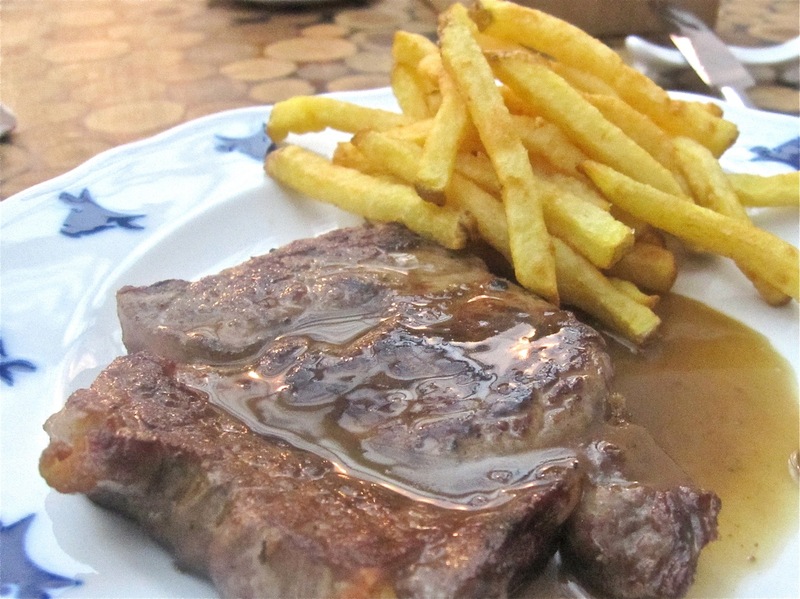 If you happen to not be in the mood for sitting in the cave that is El Barrio de Angel, wander around the corner to Lokalblok and try their Entrecote. Very nicely done and they are cutting their own fries now, too. You are just like Ron Swanson! but when i stayed in prague last time. 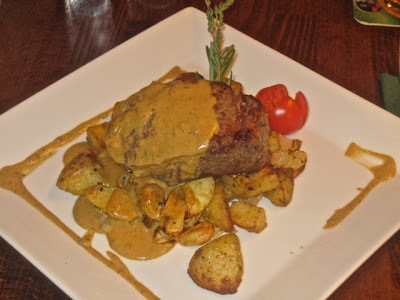 the, urugayske steakove where verry nice i tried the 300 gram for 279 cz. they booth wer verry good. Czech beef generally comes from old cows that don't give milk anymore. You really shouldn't eat it. There are some farms breeding beef cattle though.